Globat Review 2019: Is Globat a Good Hosting? Globat is U.S. hosting company that provides quality and affordable web hosting services to thousands of customers around the world. Over the years they have hosted more than 100,000 websites. Founded in 2001, Globat is a small web hosting company that offers low cost and reliable hosting plans with shopping cart features to individual customers and businesses in the US and around the world from their two data centers in Boston. Customers can also order domains, support services, WordPress optimization, and backups along with their hosting packages. Globat doesn’t overwhelm their clients with hosting options. 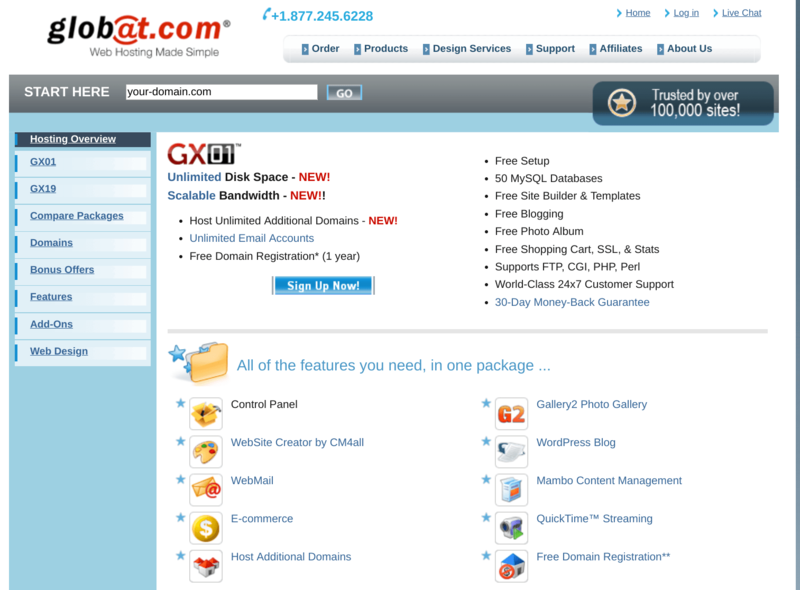 They have just two shared hosting plans, GX01 and GX19, both of which come with unlimited bandwidth and unlimited domains. With unlimited disk space and scalable bandwidth, their starter plan can host a number of database-driven websites. You can build a blog, a photo gallery, or a simple static website using the free website builder that gives you access to several free websites templates. If you’d like to set up a simple e-store with 50 product listings, then the GX19 package with ShopSite shopping cart and SSL will be what you need. With no history of data breaches, you can be confident that your data is safe with Globat. Their data centers also have backup power generators and uninterruptible power supplies (UPS) to ensure that your websites never go offline in the event of a power outage. Most importantly, they carry out regular backups of databases, emails, and websites. You’ll also be happy to hear that onsite technicians monitor their servers and network 24/7. Although there’s no mention of an uptime guarantee, I’m confident that the technical support team will resolve server issues before they affect your website or web apps. Simplicity is a key with Globat hosting. When you sign up, you get access to a user-friendly control panel with a file manager, webmail, CGI script, website stats, and other account management features. Globat is a cheaper alternative to the many overpriced but basic hosting plans on the market. Their plans are suitable for customers who want to host simple websites; plain and simple. And Globat’s two packages seem to meet that brief almost exactly. You can also get extras such as domain privacy, WordPress optimization, a premium website builder, website security, and G Suite plus site backup and restore. All at reasonable prices. And setup is free. Your account will become active from the moment you pay, and if you pay for one year or more you’ll get a free domain and Let’s Encrypt SSL. Should you encounter any problem with Globat’s hosting, you can contact their technical support team via live chat, online ticketing system, or their U.S. phone number. Also take time to check out their detailed knowledge base and tutorials, where you’ll find answers to most common questions. Globat provides simple and affordable web hosting solutions, and their many customers are a testament to the quality of their services. Wondering how Globat stacks up against other Web Hosting companies? Enter any other Web Hosting company and we will give you a side-by-side comparison.